One of my most popular blog entry is the one about Json. I have also had some questions outside this website about this topic. This week I got a task. 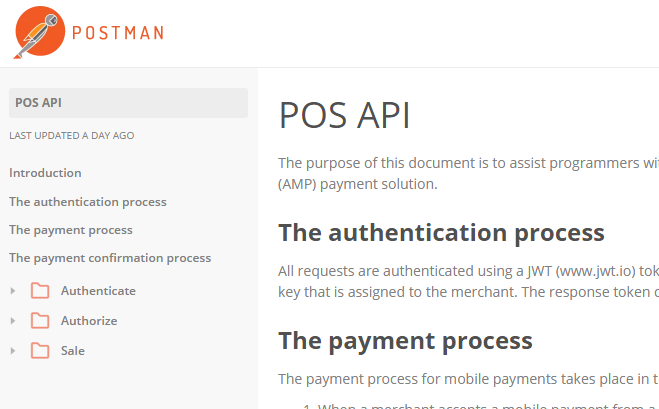 We need to communicate with a payment service that uses REST web services and Json file format. I got a document describing the service. Some methods use GET and some use POST. Here is how I did this. In the heart of it all I use Codeunit 1297, “Http Web Request Mgt.”. Every time we talk to this POS API we send an Access Token. If we don’t have the token in memory (single instance Codeunit), we need to get a new one. That is what the above code does. The ParameterMgt Codeunit is what I want to focus on. 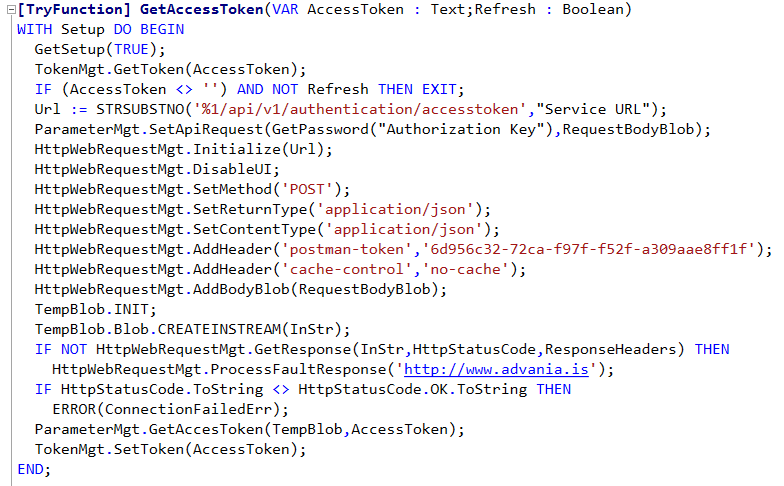 You can see that I start by inserting my “Authorization Key” into the RequestBodyBlob. As usual, I use the TempBlob.Blob to get and set my unstructured data. The interesting part here is that I use an XMLPort to create the data I need to post to the Api. A simple one in this example, but nothing says it can’t be complex. Then I convert the Xml to Json with a single function. The last TRUE variable means the the Document Element will be skipped and the Json will look like it is supposed to. The REST service response is Json. And to read the Json response we take a look at the GetAccessToken function. Here I start by converting from Json to Xml. And make sure my Document Element name is “posApi”. And I have the result. 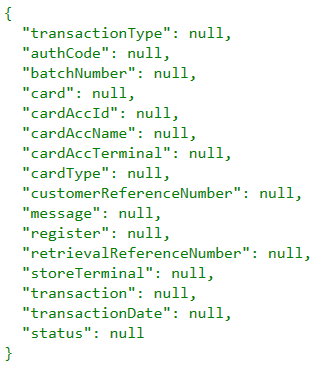 As you can see from the documentation some of the Json data is more complex. This method will work nevertheless. I suggest that with our current NAV this is the easiest way to handle REST web services and Json. 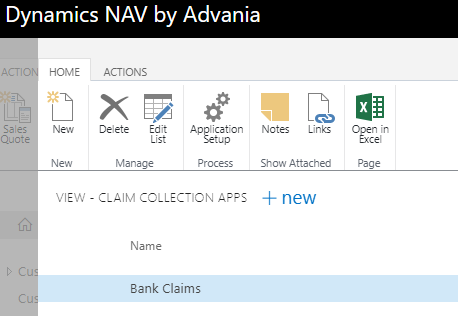 I have made several enhancements to the Data Exchange Framework in NAV 2016. Previously I wrote about text or a comma separated file import and about access to a local data file when creating a xml/json structure. Both those enhancements are included in the objects attached to this post. I have needed to handle JSON files where the actual data is not in the node value but in the node name. To support this I added a boolean field to the Data Exchange Column Definition table (1223). To support this I added the same field to the Data Exchange Field Mapping table (1225) as a flow field, calculating the value from the definition table. 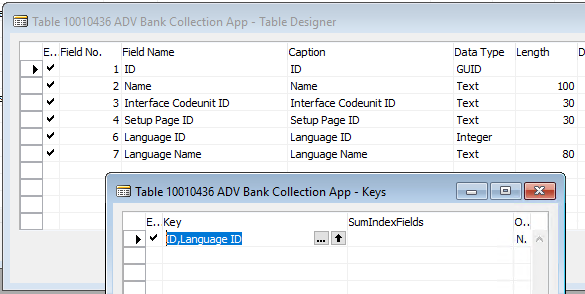 Codeunit 1203 is used to import XML and JSON files into the Data Exchange Field table. I made two changes to the InsertColumn. First, I added a parameter that accepts the node name and if the above switch is set to true I insert the node name into the column value instead of the node value. The other change is that instead of finding only the first Data Exchange Column Definition I loop through all of them. This allows me to create more than one definition based of the same XML node and therefore import into multiple columns from the same node. 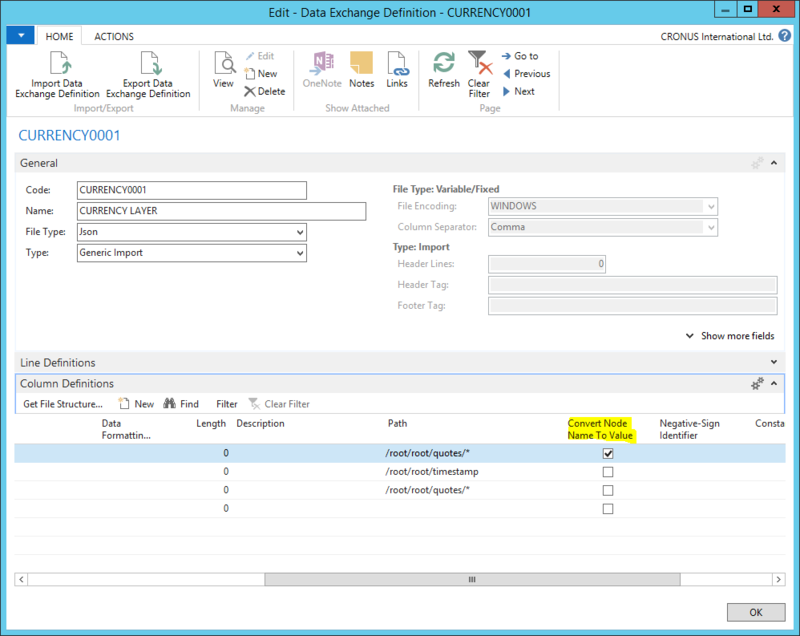 To enable this scenario in the Currency Exchange Update Service I made changes to the Data Exchange Field Mapping Buffer table (1265) and the Data Exchange Setup Subform page. More on that later. A JSON file without a single root element will cause an error in the standard code. Inspired my Nikola Kukrika on NAVTechDays 2015 I made changes to Codeunit 1237 utilizing the TryFunction to solve this problem. To top this of I made a simple change to the Currency Exchange Rate Service Card page (1651) and table (1650) to allow JSON file type. 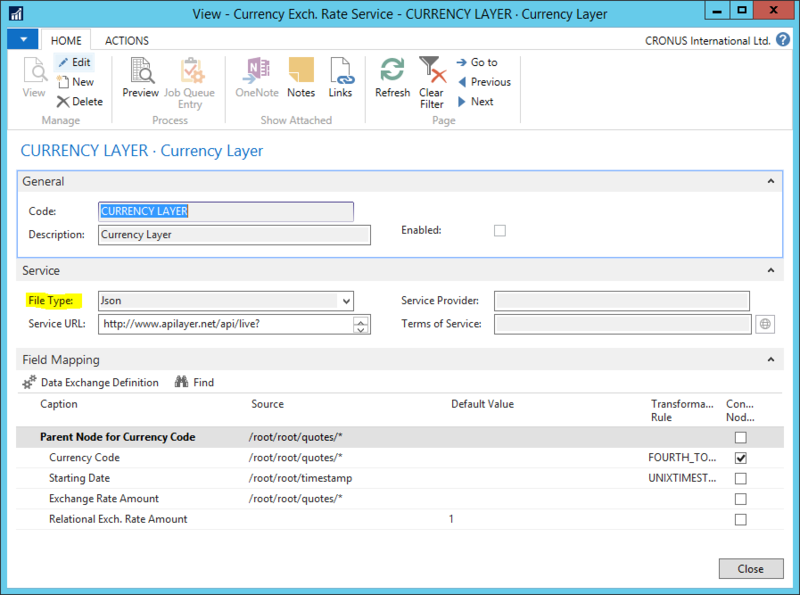 Having completed these changes I can now use a web service that delivers JSON in my Currency Exchange Rate Service. 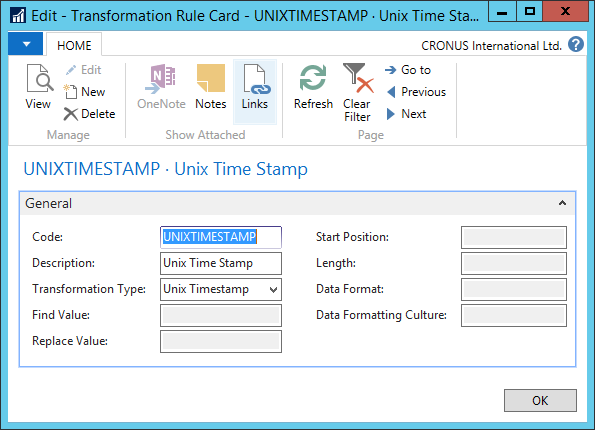 Also inspired by Microsoft I added a transformation type to the Transformation Rule table (1237) to convert the Unix Timestamp (seconds since January 1st 1970 UTC) to a date. In computing, Representational State Transfer (REST) is a software architecture style for building scalable web services. REST gives a coordinated set of constraints to the design of components in a distributed hypermedia system that can lead to a higher performing and more maintainable architecture. RESTful systems typically, but not always, communicate over the Hypertext Transfer Protocol with the same HTTP verbs (GET, POST, PUT, DELETE, etc.) which web browsers use to retrieve web pages and to send data to remote servers. REST interfaces usually involve collections of resources with identifiers, for example /people/paul, which can be operated upon using standard verbs, such as DELETE /people/paul. As we are used to XML as the body for our SOAP messages we can also use XML as the body for a RESTful web service. 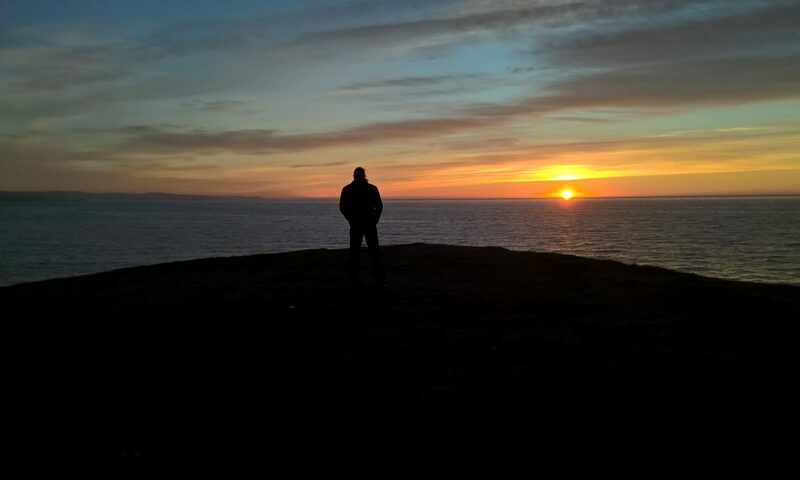 I just finished writing a code to communicate with Azure from NAV. This communication was using RESTful web services and XML. 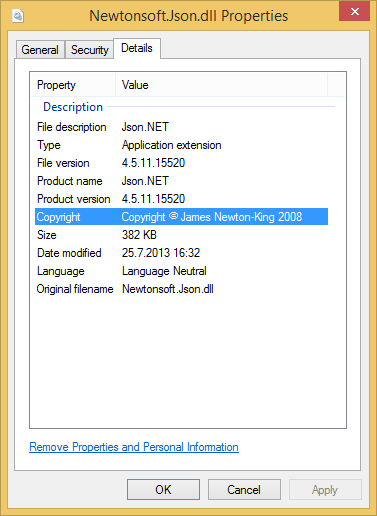 With this Json.NET in Dynamics NAV Add-ins folder we now have some way to handle JSON files. Using this Add-in I created a NAV Codeunit to manage JSON text. With these functions NAV should be able to handle JSON files without any problems. Now you can add JSON handling to your arsenal.